Desperate to escape the abuse and poverty of his youth, the masked man becomes involved in the flesh trade. He’s amassed a fortune by selecting women with specific attributes requested by his buyers and been able to satisfy his own perverted sexual desires. With the help of his partner he’s managed to elude the police, but with having to dispose of one of the women from his previous collection, things are beginning to get messy and he’s determined this will be his last shipment. While the women strive to bolster one another’s courage through a hell that threatens both their sanity and their lives, four men urgently lead the search for their rescue. All four have their own personal agenda and distractions. Once again giving the masked man a chance to evade capture. 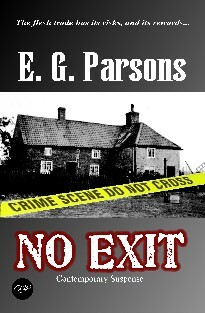 NO EXIT is a partially rewritten – retitled release of Captive Fear.